This is a painting that I did in 2006 for a couple in the Detroit Metro area. I actually painted several paintings of their home and the surrounding gardens. This small piece, only 13.5" x 9.5", was my favorite of the entire series. This shed was so charming! The homeowner told me that she ordered it from an Amish builder in Pennsylvania and had it shipped to Michigan on a truck! The challenging area for me was the glass top; I really wanted to get the reflections right. I enjoyed painting the pine trees also. Of course, trees are usually fun for me since most of my work is considered landscape painting. 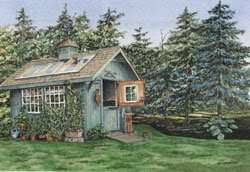 You can see a larger image of this on my website at: http://watercolorworksart.com/AmishShed.